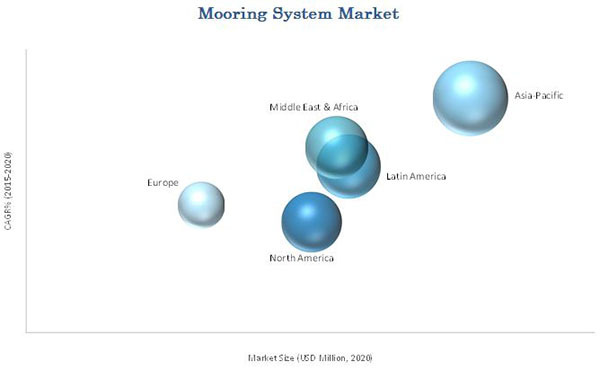 [140 Pages Report] The mooring systems market is estimated to be USD 1.58 Billion in 2015. The market is projected to grow at a CAGR of 3.7% from 2015 to 2020. Mooring systems are combined package that includes mooring lines, anchors, connectors, winches, fairleads, which is installed onto the vessels for the station keeping of the floating platforms. Mooring systems includes applications related to type of production vessels such as FPSO’s, SPAR’s, semi-submersibles, tension leg platforms, and to depth like shallow and deep/ultra-deep. Rapid technological developments improving the drilling and production capability of rigs and vessels aid exploration and production activities in the deep-water and ultra-deep-water areas across the globe. These provide the boost for the mooring systems market. 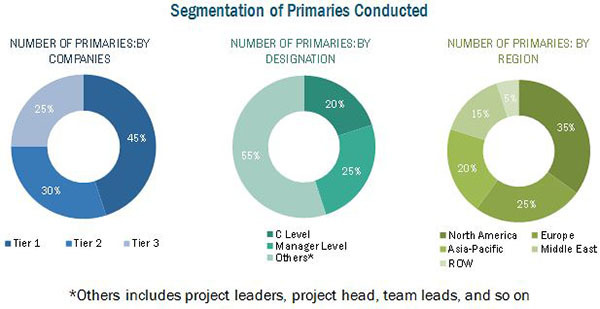 This study answers several questions for the stakeholders, which include OEMs, EPC companies, oil & gas service providers, distributers & suppliers, consulting firms, private equity groups, investment houses, equity research firms, and other stakeholders. It gives them information about market segments to focus in next two to five years for prioritizing the efforts and investments. It covers various important aspects of the market. 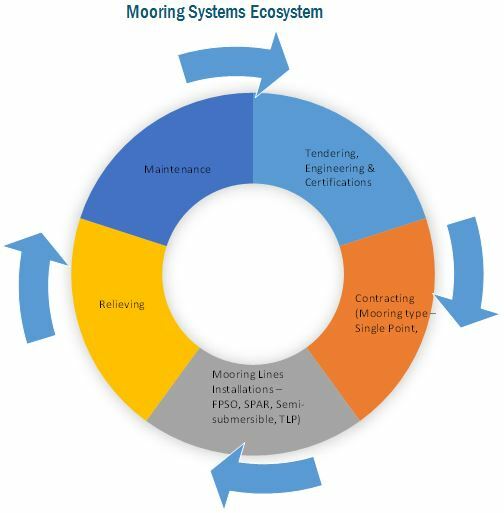 These include analysis of value chain, Porter’s Five Forces model, competitive landscape, market dynamics, market estimates in terms of value, and future trends in the mooring systems market. The increase in the energy demand has resulted in the rise in oil & gas production from the regions such as North America and the Middle East. Due to the maturing onshore oil & gas fields there has been a shift of exploration & production activities towards offshore reserves. The global mooring systems market is expected to grow from USD 1.58 Billion in 2015 to USD 1.89 Billion by 2020, at a CAGR of 3.7%. Asia-Pacific accounted for the largest market share and is projected to grow at the highest CAGR during the forecast period. The Market for mooring systems has also been classified on the basis of applications such as shallow water, deepwater, and ultra-deepwater based operations. Nearly half of the mooring systems market is covered by shallow water applications, but with the advent of advanced technology, the operators are entering into deepwater and ultra-deepwater zones. Moreover, decreasing production in shallow water basins and large potential of untapped subsea hydrocarbon reserves are contributing in the increasing focus in deepwater drilling. There has been increasing deepwater oil discoveries in India, Africa, Australia, the U.S., Russia, and Norway. Oil discoveries in African region especially Ghana, Congo, Mozambique, and Angola are creating lucrative business opportunities, where market players are trying to focus on enhancing their revenue. The mooring systems market has also been classified on the basis of mooring type into single point mooring, spread mooring, tendon mooring, and dynamic positioning. Single point mooring occupy the major share among mooring types and is expected to grow at a steady rate during the forecast period. It finds its major application in the vessel type FPSO and FLNG. It is preferred over the spread mooring due to its ability of easy weathervane, requirement of less mooring legs, and easy offloading. The single point mooring market is expected to grow from an estimated size of USD 0.68 billion in 2015 to USD 0.83 billion by 2020. Various drivers pushing the market are rapid technological advancements in drilling and exploration techniques, which in turn help increasing focus on deepwater & ultra-deepwater locations. The recent decline of oil prices have affected the exploration & production activities across various regions and so the revenues of oil & gas operators. Trickling down the effect, there has been decline in new vessel installation in the field and so the growth of mooring systems is sluggish in 2015. Various players in the market are focusing on contracts & agreements for their geographical expansion and surge in the customer base. 12.7 Grup Servicii Petroliere S.A.
12.8 National Oilwell Varco, Inc.